Do you know that you can give your house a more elegant and beautiful look after building? It is always possible to make your house or office look better by using interior décor products. If you need your walls to look cool and outstanding, you need more than furniture. 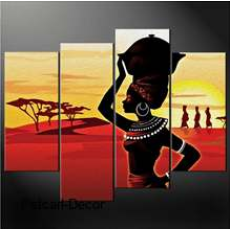 African woman wall painting is among the decorative items that you may need to add a touch of beauty in your house. Decorative paintings are a great way to connect all other color accents you have used in your house or office. You can also use African woman wall painting to create a beautiful and cheerful atmosphere in your house. It can be used in your living room, dining room and bedroom. The best thing with decorative painting is that, it can allow you to come up with a unique design for your wall. Are you searching for a shop where you can purchase cool paintings for your house? Petcarl Décor is a genuine shop where you can obtain what you are looking for.